Shred carrots, courgette/zucchini, and potatoes through a cheese grater. Mix shredded vegetables, onions, parsley, brown rice flour, egg, salt, and curry powder in a bowl. Heat olive oil in a non-stick skillet. Spoon the vegetable mixture into the hot oil, shaping each latke with an egg ring. Fry the latkes for 3 minutes per side over medium heat. Here is a ‘grate’ side dish for the gluten-intolerant – or a way to get kids excited about vegetables. Packed with flavour and fibre, the mixture can be made in advance, and then simply portioned and fried for 6 minutes to glorious, crispy perfection. 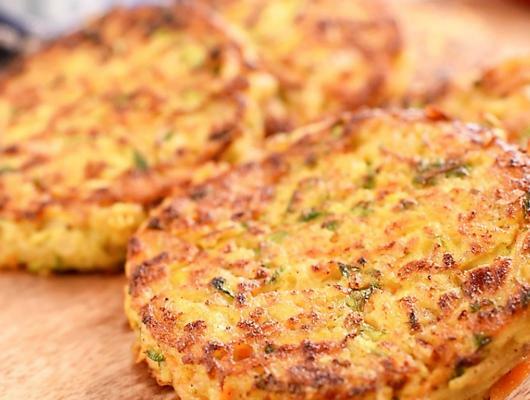 Don’t forget to drain off that excess oil once done, nobody wants a soggy, greasy latke..